Razer teased the Blade, an upcoming 17.3" gaming laptop with Intel's Core i7 2640M, NVIDIA GeForce GT 555M with Optimus technology, 8GB DDR3 1333MHz, 320GB 7200RPM SATA HDD, 802.11b/g/n WiFi, HD webcam, and a 60Wh battery. One of the special features is the Switchblade User Interface, it offers 10 dynamic adaptive tactile keys for easier access to in-game commands, and a multi-touch LCD that can display in-game information. The system will ship in Q4 2011, pricing is a hefty $2,799.99. The PC industry today has never looked bleaker. The world’s largest PC-maker Hewlett-Packard just announced their intention to explore the separation of its PC business. With PC manufacturers increasingly abandoning design and technology in lieu of outsourcing and cost-cutting, the PC industry has seen a severe dearth of innovation in recent years. Gaming consoles have also taken advantage of this innovation slump in the PC industry to garner attention from game developers and gamers alike, to the extent that now PC versions of cross-platform games are often sub-par ports of their console counterparts. Razer, the world leader in high performance gaming hardware, introduces the Razer Blade – a full aluminum chassis gaming laptop featuring true portability, incredible performance, and an all-new revolutionary user interface. With the introduction of the Razer Blade – a feat of modern-day systems engineering and technology, Razer is reinvigorating technological and design innovation for the entire PC industry, and encouraging gamers and developers to return to the PC as the primary gaming platform of choice. Mobile systems developed for gaming today compromise on portability and form factor for game performance. While such machines run games well, they are over 2 inches thick and can weigh more than 10lbs. The Razer Blade measures 0.88 inches thin, less than half that of current mobile gaming systems, and weighs only 6.97lbs, achieving a balance between portability and performance – making it the world’s first true gaming laptop. Developed in partnership with Intel, the Razer Blade features a fast Intel® Core™ i7 processor and a high performance NVIDIA GeForce® graphics processor. The hardware was designed to run the most demanding games of today without sacrificing the laptop’s portable form factor. The Razer Blade also does not compromise on screen size as it comes with an incredible LED-backlit high-definition 17” display. The Razer Blade features the Switchblade User Interface - Razer’s multi-award winning, highly intuitive interface technology. The interface is comprised of 10 dynamic adaptive tactile keys for easier access of in-game commands, and an LCD capable of two modes: one mode that displays in-game information when a mouse is in use; and another mode that functions as an ultra-sensitive, multi-touch panel designed for gaming on the go. 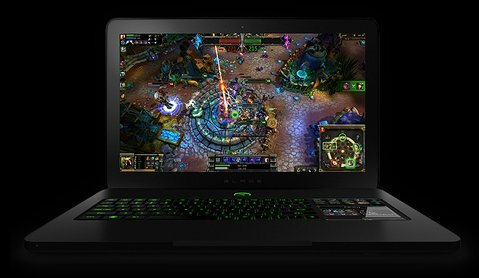 “Powered by an advanced NVIDIA GeForce® GPU with award winning NVIDIA® Optimus™ technology, the Razer Blade has the muscle to run cutting edge games with intense graphics while still offering amazing portability,” said Rene Haas, General Manager of Notebook Products, NVIDIA. “The Switchblade User Interface on the Razer Blade is a revolutionary innovation that truly defines the new standard for gaming experiences on a laptop,” said Min-Liang Tan.